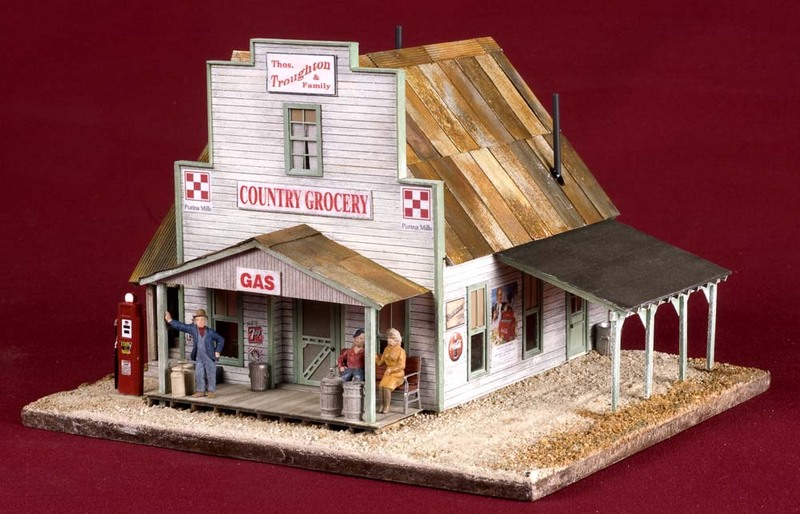 Troughton Family Country Market started life as a Banta Modelworks Limited Production, "S" scale, "Everest Country Store," kit. The laser cut wood kit has a footprint of approximately 6" x 6.5" and includes a thin aircraft plywood inner shell with scribed basswood and stripwood exterior pieces. 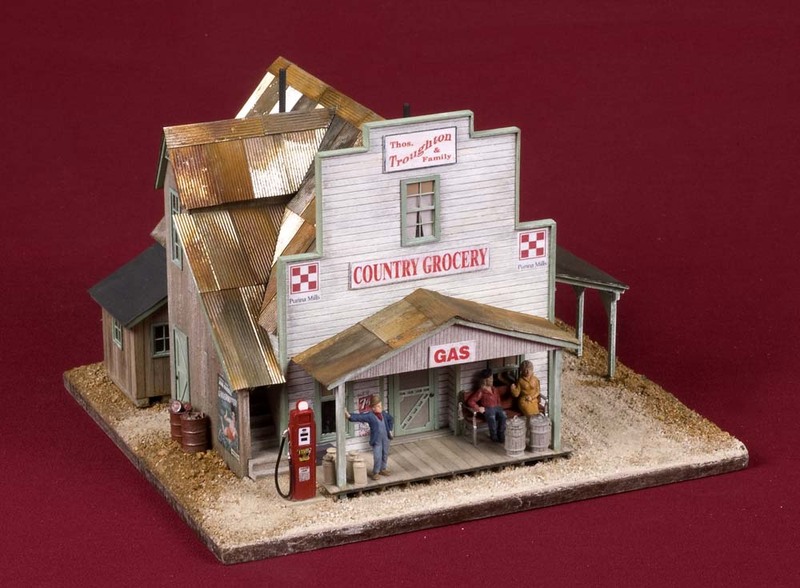 Corrugated metal roofing, silk span tissue material for the car port roof and a sheet of printed signs and logos along with a plastic bag of metal detail parts are included. 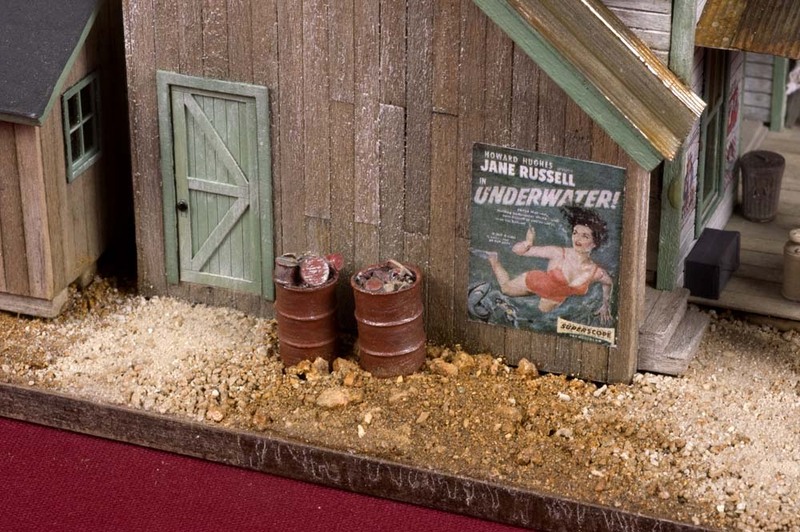 The only items shown in these photos that are not included in the kit are the figures which came from "Fun and Games,"
The building was mounted on a piece of 1/4" thick Masonite that had the edges cut at an angle so it could be easily dropped into place on the layout. 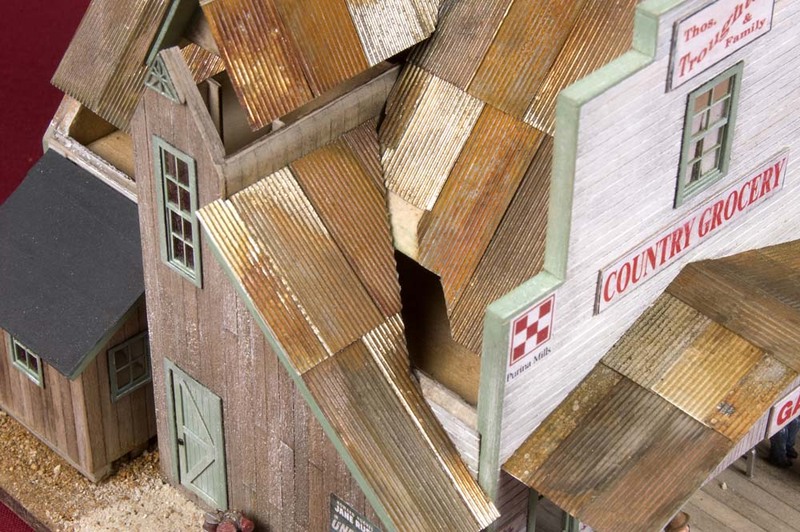 The metal roofing was lightly etched in printer circuit etching solution purchased from Radio Shack. 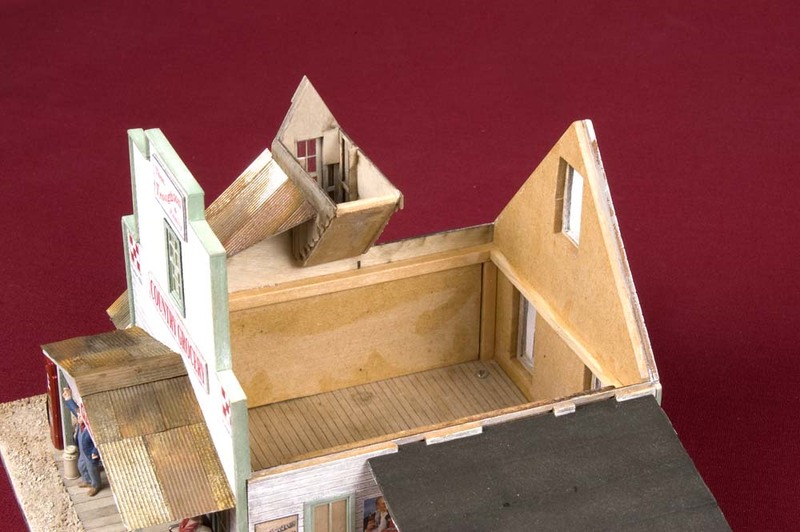 This view of the left side and rear of the building shows the stripwood covered stairway and second story window. The wood was weathered with an alcohol and black shoe dye solution before being glued to the laser cut framing components. The building took longer to complete because I assembled it so the roof could be removed to add interior lighting at a later date. 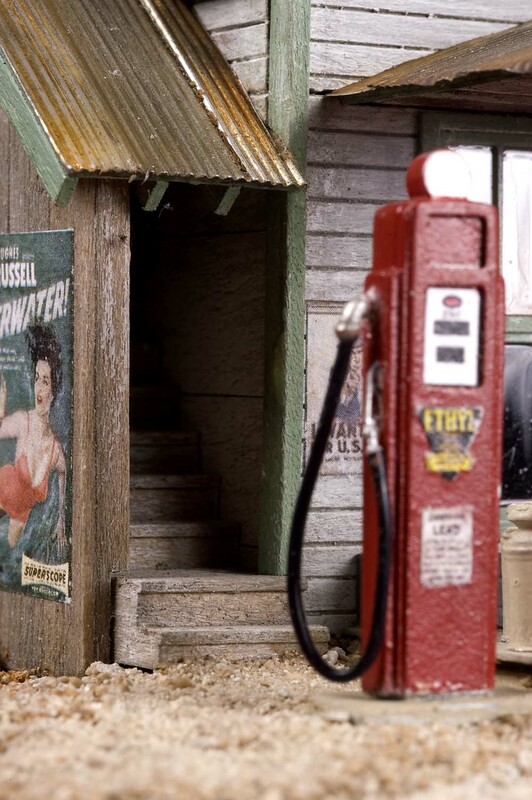 The focal point of this photo is the gas pump. It's a metal casting and uses a short piece of wire and an extremely small and thin casting of a nozzle. I had to use a small rounded head grinder in a Dremel tool to open the space in the pump for the nozzle to be secured in place. 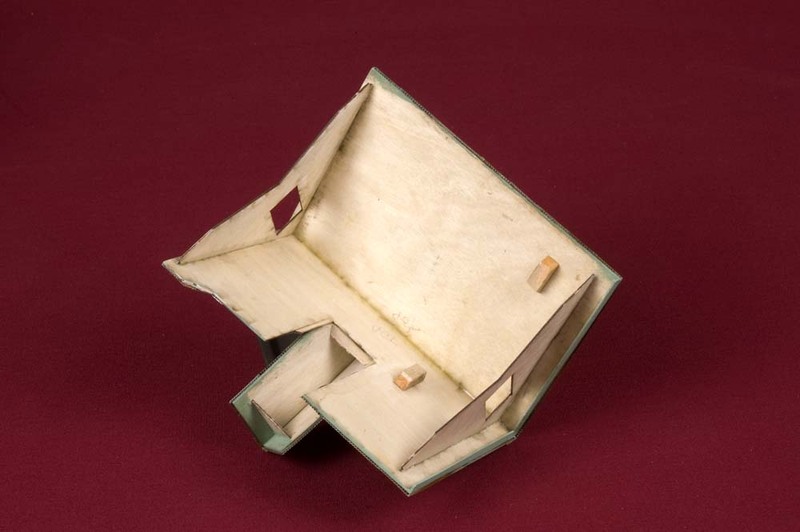 The pump casting was pinned and glued to a small piece of Masonite which was painted to look like a concrete slab. The figures of the two ladies sitting on the bench were not included, but the bench was. 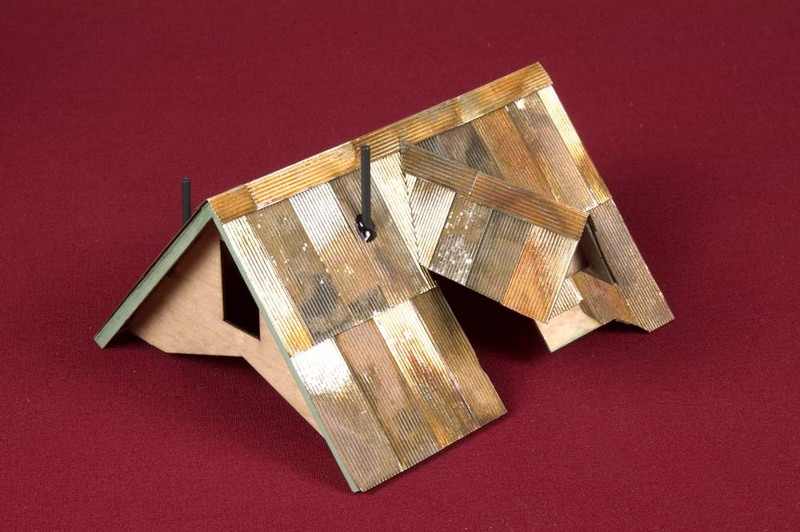 It's comprised of two end pieces of thin metal castings and two small laser cut wood components. 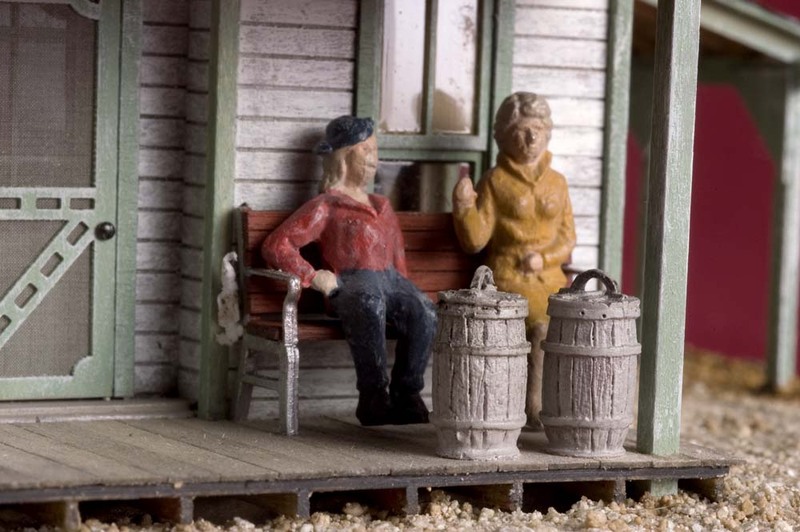 The two wooden barrels in front of them are highly detailed metal castings that were painted with acrylic craft paints and weathered with the shoe dye and alcohol solutiion. The movie poster featuring Jane Russell was one of several items included on a printed sheet. It was cut from the sheet and placed face down on a smooth surface. The back was dampened with a few drops of water and rubbed with my finger to remove some of the paper. I stopped when I could see the layer of ink. The thinned poster was allowed to dry a bit, then placed into a puddle of Aleen'e Tacky Glue that had been diluted and smeared on the building. The poster was pressed into the glue with the flat end of the metal handle of a hobby knife. The two barrels are castings that were painted with craft paints and lightly dry brushed with Polly Scale Aluminum paint. The glazing in the side door was attached with AC adhesive, then a small amount of, "Pledge Floor Finish With Future Shine," was brushed on the exterior surface to represent old glass. 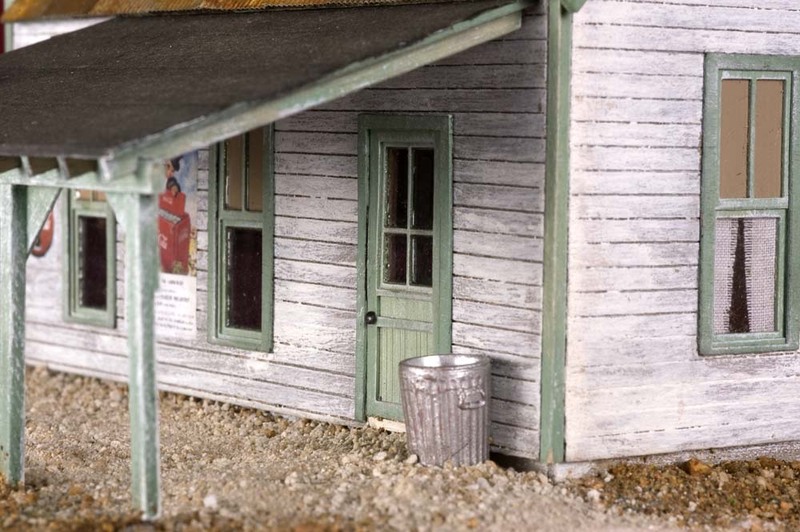 The metal trash can is empty, leaving the modeler the opportunity to fill it up with whatever trash is necessary. The right side wall sports a few more posters and signs. Some of these came on the printed sheet that was included in the kit, but others were also found on the Internet. The interesting feature in this photo is the screen door. 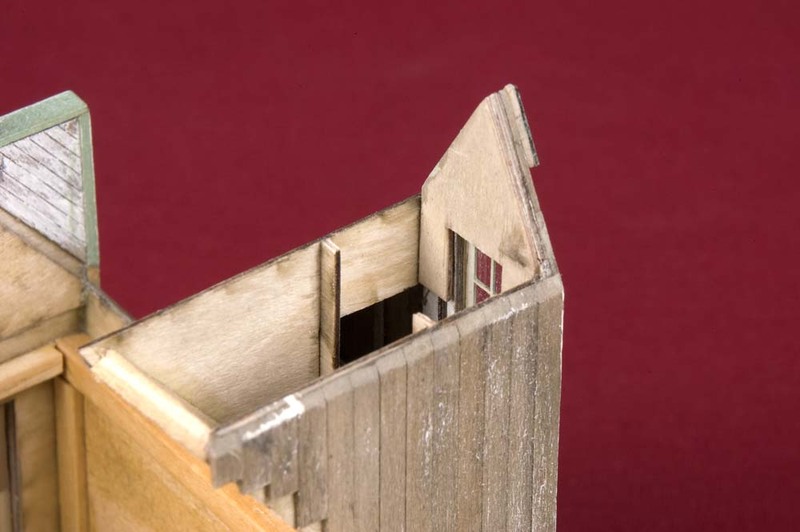 It's comprised of two door castings, glazing and a small piece of fine screen material. 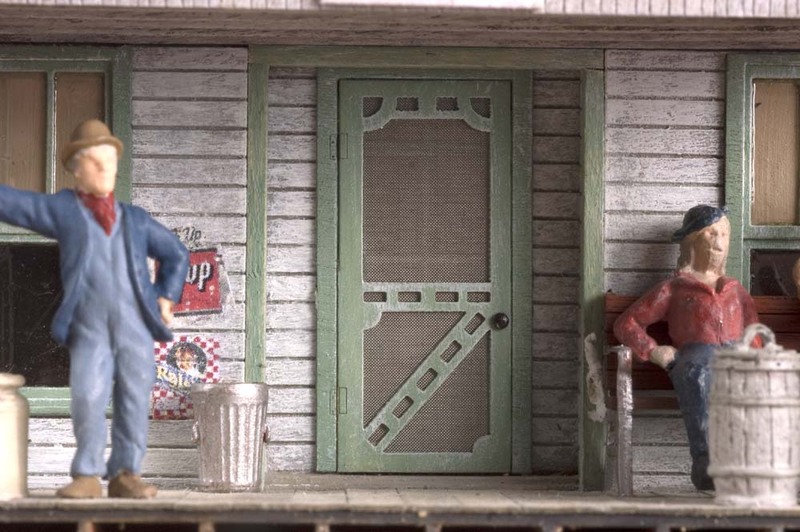 The screen door could be build in an open position, but I decided to build it closed. The head of a extremely small pin is used to represent the door knob. All of the windows received pull down shades, but some also received curtains. 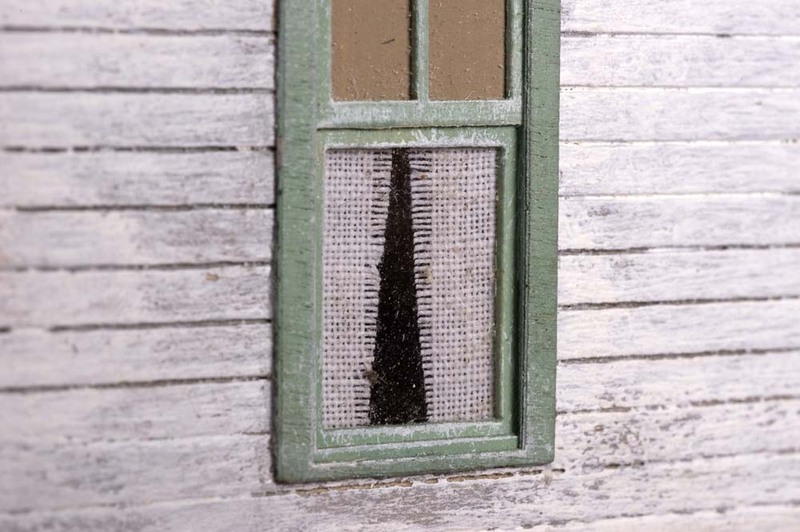 The fabric from an old hankerchief was ironed flat, then trimmed to fit behind the window components. The visible edges were teased with the point of a #11 hobby knife blade to unravel the threads to represent edge fringe or trimming. The trimmed fabric was carefully attched to the inner side of the window with a few dots of the Tacky Glue. 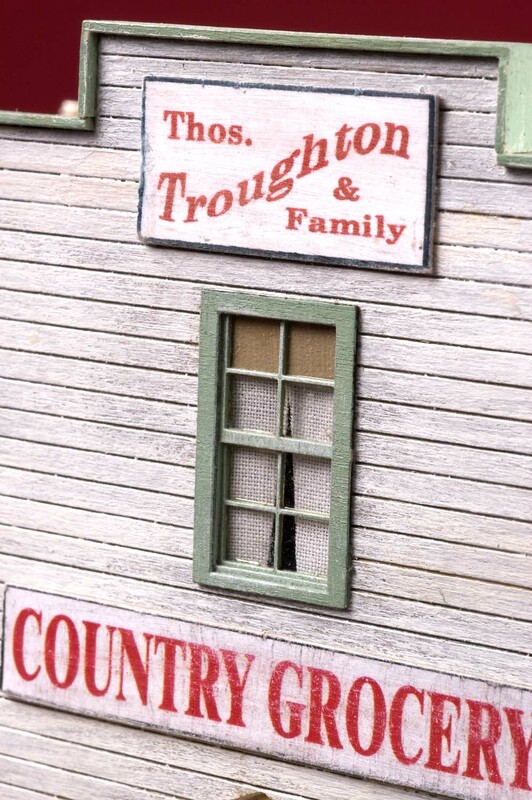 The Troughton family sign was created on a computer and printed with red ink to match those included in the kit. The signs were thinned like the posters and mounted to thin pieces of aircraft plywood which were then tacked glued to the front wall. 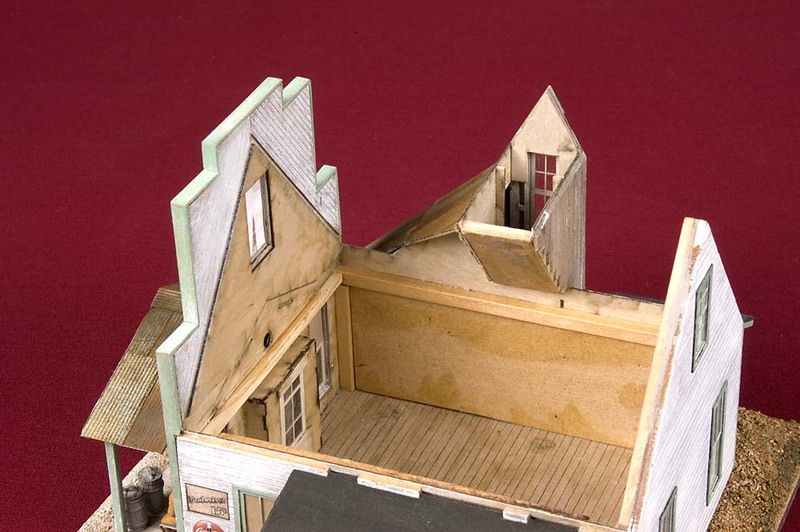 While it doesn't show much, the enclosed laser cut stairway leading to the second floor apartment shows the high level of detail represented in this kit. This photo shows what I did to the interior to add a ceiling to the main room and demonstrates that the roof can be removed. It would have been easier to build with the roof permanently attached, but I decided to go a different route. 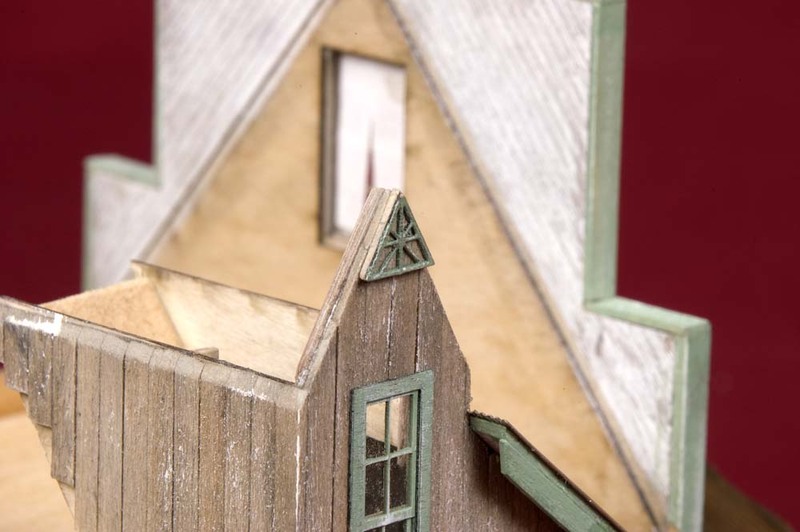 The components that make up the side dormer extended much further into the interior space of the second floor, but in order to make the roof removable, I had to remove some of the material. 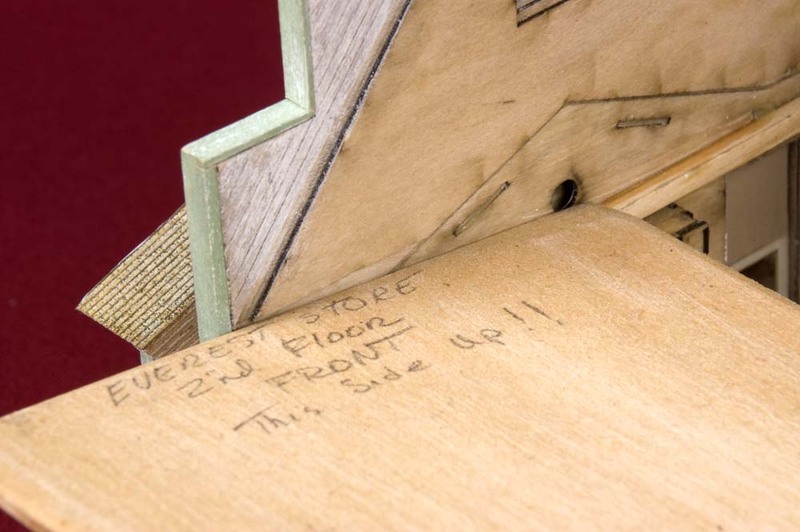 There was another angled piece of plywood from the dormer that had to be removed to allow the roof to be easily slide into place. The hankerchief fabric can be seen here after being trimmed to shape the drapes and glued in place to the back side of the paper shade material. The interior can be seen better in this photo. To strengthen and straighten the walls, I laminated 1/8" untempered Masonite panels to them. The panels were needed because the walls warped inward a bit after painting them with the acrylic craft paints. I could have prevented that by painting them first with sanding sealer. I also reinforced the corners with short lengths of square strip wood. A ceiling made from the Masonite material was cut to size and slid onto the square pieces of strip wood. A small portion of the roof support that's glued to the back side of the front wall had to be removed for the ceiling piece to slide in easily. One thing to note here is the hole in the front wall. It's there to allow the builder to route a small wire out to the ceiling of the front porch for a light. The ceiling is in place and it's evident why some of the interior material that forms the side dormer had to be removed. I believe it would have been impossible to slide the ceiling in place if things had not been altered. Because the little triangle piece of trim would have prevented removing the roof, I mounted it permanently to the face of the dormer wall. 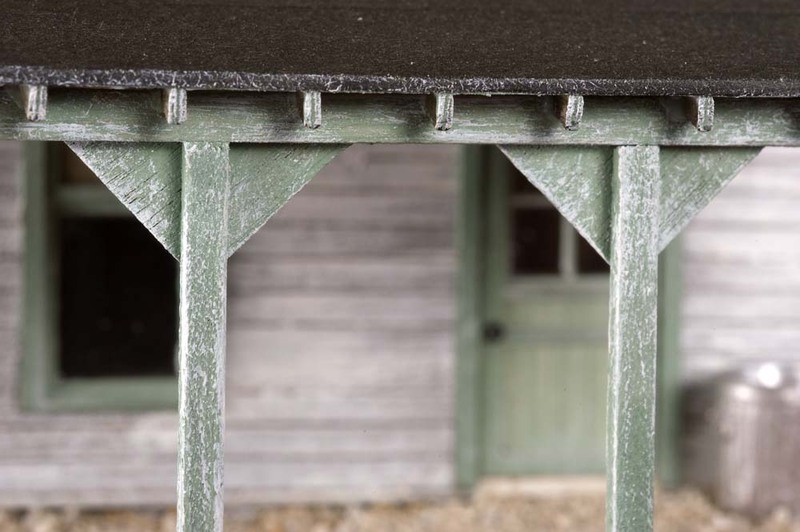 To make it appear as though it's attached closer to the edge of the eave, a small piece of bass wood was placed behind it to move it outward a bit. 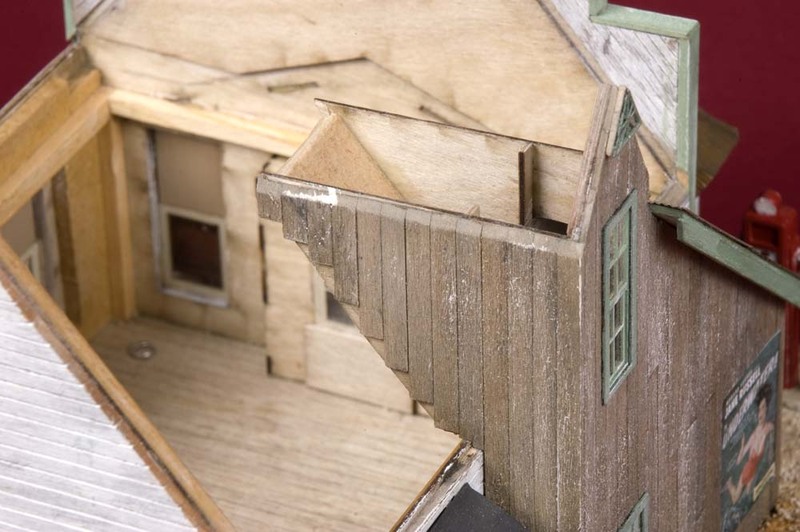 I made the complete roof removable which involved reinforcing the bonds between the dormer and main roof. 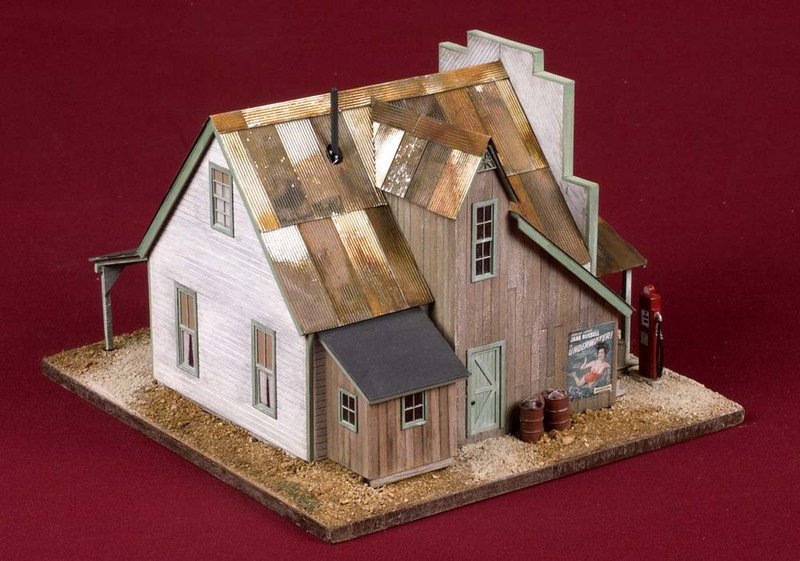 The corrugated metal was trimmed to a scale 3' width, then etched in Archer's Etchant from Radio Shack to give it a weathered effect. 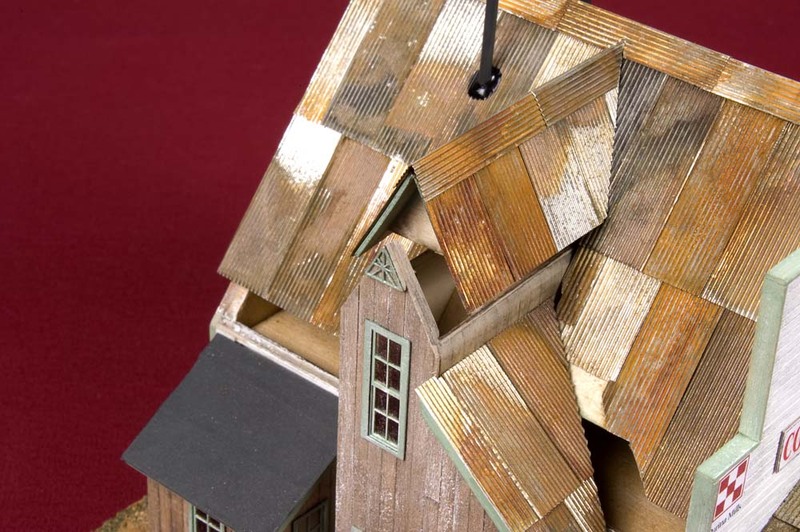 Once it was attached to the roof panels with Aleene's Tacky Glue, it was given a further wash of a rusting solution that was made over three decades ago by dissolving steel wool pads in vinegar. 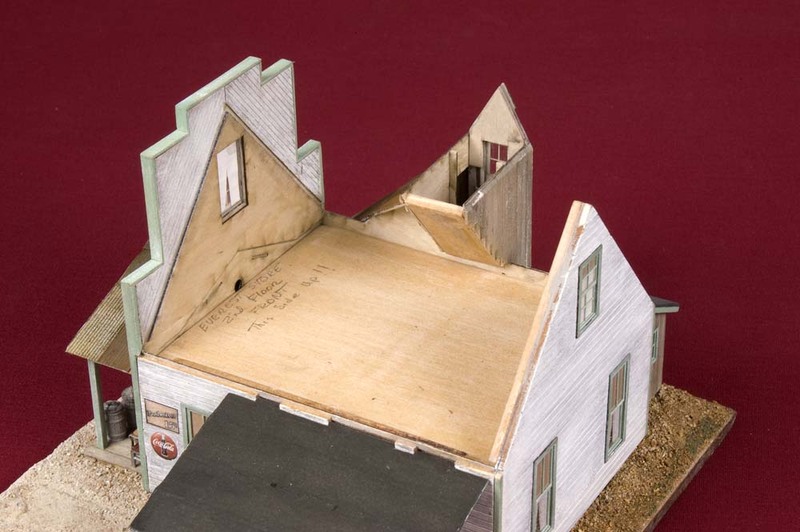 The underside of the roof component shows the two pieces of scrap wood that were glued in place to help support the two pieces of brass stove pipes. Also evident is the extra yellow glue used to reinforce the bonds between the roof panels. The roof is easily slid into place by carefully working it into position. It took quite a while to rework things, but the end result is worth it when interior lighting is added later. 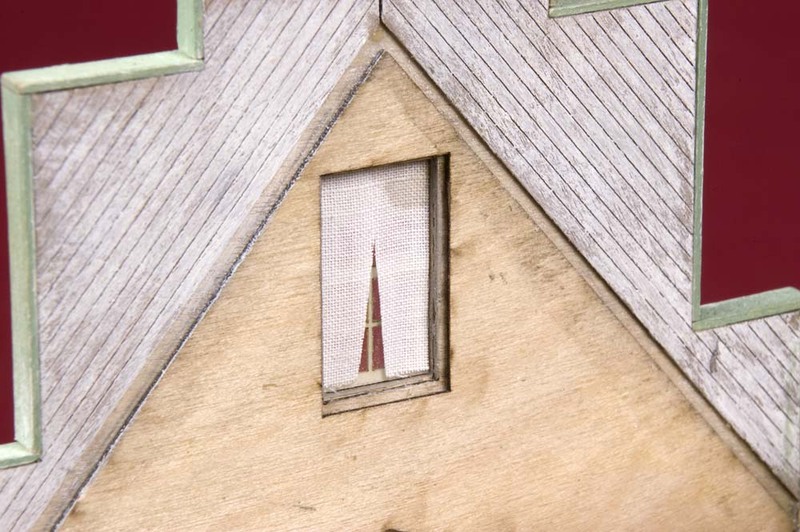 As mentioned before, the small triangle of trim will appear to be attached to the underside of the eave of the dormer. The fringe on the window curtain is readily visible in this view of one of the rear windows. This effect was done on all the curtains that were added to the windows. The four side post to the car port were reinforced with triangular gusset plates where they met the top timber. It wasn't necessary for strength, but as a precaution I took so that they wouldn't be damaged as I was working with the building. 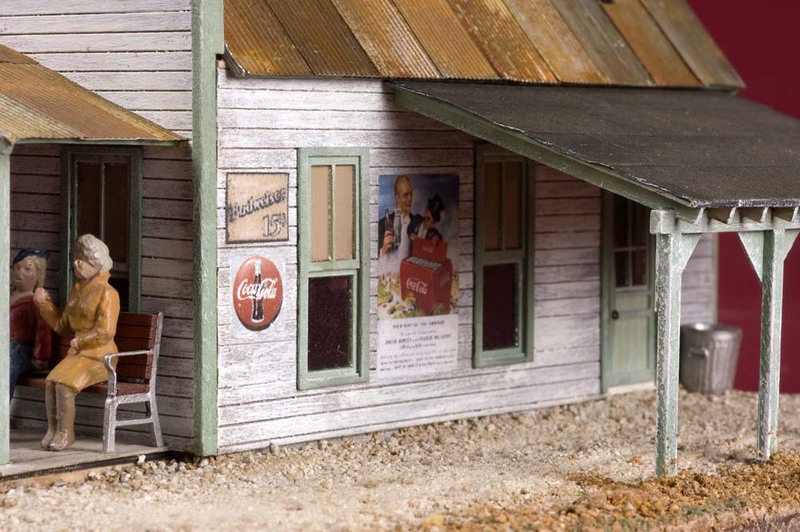 This photo shows the market as it sits along the front edge of the layout. 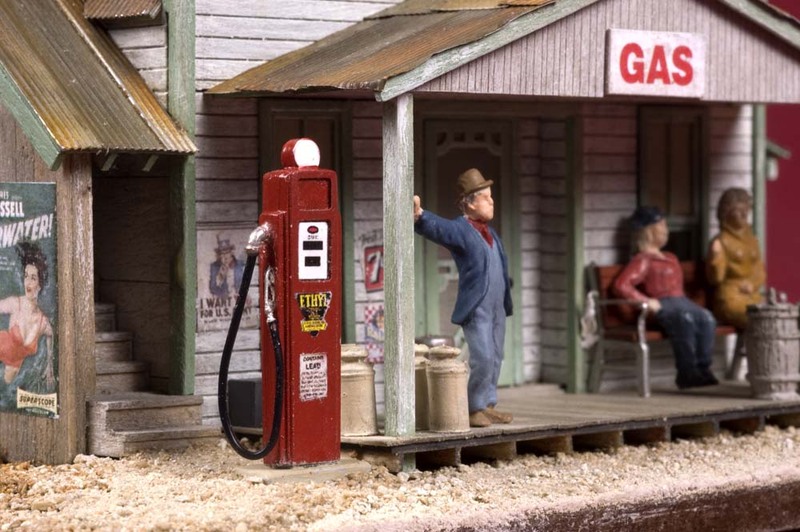 It's nestled in among the grove of towering trees directly across from the C&TT station. 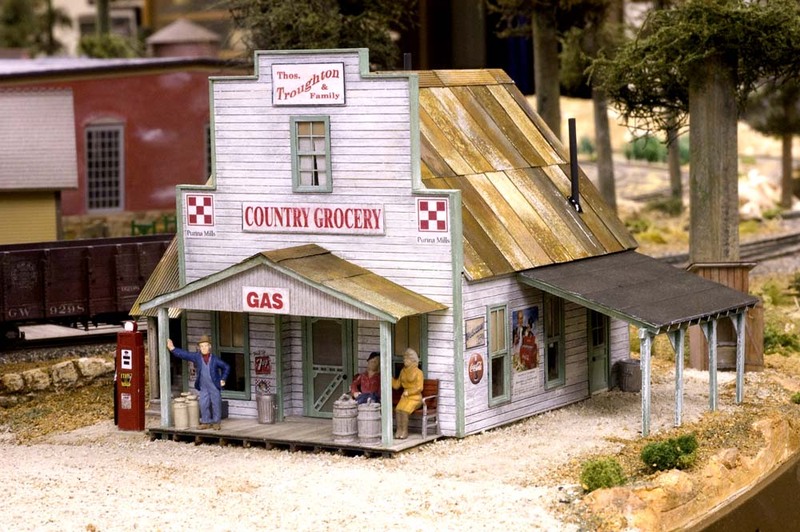 About the only thing it needs to complete the scene are boxes of fresh produce and other products brought in by the railroad or raised on the small farms in the community.